Something big is going to happen this October 14 to 16 in Las Vegas. It’s called the BlogWorld & New Media Expo, the first and only tradeshow, conference, and media event created for the rapidly growing industry of blogging and new media. We here at Lakeshore Branding are going to attend the event, but if that’s not enough to convince you to come and join us (it should be more than enough to convince you, though!) then here are the top six reasons why BlogWorld & New Media Expo is a can’t-miss. Money? Influence? Or both? : If you’re a small business owner, Internet marketer, e-Commerce store owner, corporate executive, online journalist, podcaster, broadcaster, or personal or professional blogger who has some form of stake in the web, then surely you’ll have plenty to gain by attending the event and learning more about the top strategies, tools, and technologies used in developing content for the web today. BlogWorld 2010 is where you do just that. Experts and newbies: As the premier blogging and social media event of the year, BlogWorld is a huge educational experience for people in all levels of expertise and interests. Yes, the usual industry experts will be there, but don’t be shy: there’ll be plenty of beginners too who are eager to learn from the various seminars and moderated panels. Diversity of Topics: If you’re worried that you might not find anything in there that’s relevant to you, then think again. This isn’t the world’s largest new media event for nothing. There’s a Social Media Business Summit – featuring 200-plus sought-after speakers and 150 education sessions – that should cover all your bases, including everything you wanted to know about: content creation, distribution (including tools and tips on sharing content across social networks), and monetization. Networking: If there’s one event that you should go to for networking opportunities, then it should be BlogWorld 2010. You’ll have access for three whole days to first-hand interaction with the world’s most influential and successful bloggers, podcasters, Internet radio and TV broadcasters, new media and social media experts, social influencers, publishers, marketers, journalists, entrepreneurs, small business owners and Fortune 500 executives. Among the big names: Chris Garrett, Darren Rowse, John Chow, Mari Smith, Lewis Howes, and Jeremy Shoemaker. Exhibit: Some 100 companies will be gathering for BlogWorld’s huge New Media Expo, an industry-wide new media marketplace where you can find online business and marketing resources; capture critical knowledge of new technology launches, cutting-edge tools, and trends; and make important business connections – all in one convenient place. Participants in this valuable exhibit space include publishing platforms, design companies, creative agencies, web/blog/podcast hosting companies, content aggregators, add-on services, plug-ins, widgets, computer hardware and software, wireless services, podcasting products, VOIP companies, online advertising networks, news readers, RSS/syndication services, search engines, consulting companies, affiliate program partners, new media products, and more. Las Vegas = Parties = Awesome: There’s no better place to party than Las Vegas. And you know what? It’s going to be even more fun this year as BlogWorld 2010 holds its shows, sessions, and parties at a glamorous world-class venue, the Mandalay Bay Resort and Convention Center. So really, there’s no excuse to be elsewhere but in Las Vegas this weekend of October 14-16. 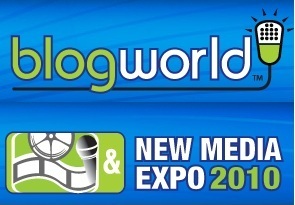 Register to attend BlogWorld 2010 today and get noticed in the world of blogging and new media.